Anyone who claims there are no stupid questions has never worked in a public library. I dropped off my purse in the house and confirmed that Aunt Lydia was not home before heading back outside. Walking past Richard's house, I stepped into the midst of the protest. this looks good. I am going to look it up on Fictfact so I can see the series. Thanks for coming by my blog. I always like to hear from fellow bloggers especially mystery lovers. I love the first line. It made me laugh out loud. Sounds like the perfect choice for book lovers. Great beginning, I am sure it is true. It reminds me of the excellent book: Weird things customers say in book shops by Jen Campell. This does look like fun. 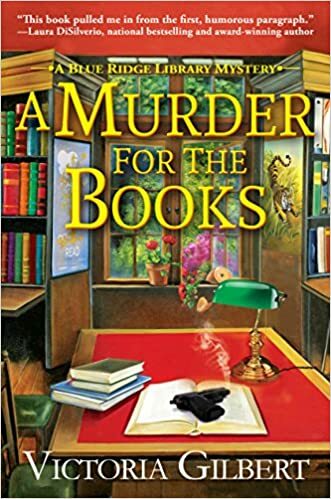 Mysteries, books, what's not to like? Bookish mysteries always grab me. Thanks for sharing...and for visiting my blog. I like the first line about stupid questions! Sounds like a fun read! Happy weekend! Oooh i love that, 'university librarian', I was one once lol Sounds like a great read. Always love one that is actually about books, with books on the cover - mad I know. It's just bookish all over! That first line had me laughing out loud. Sounds like an awesome read. That opening line is hilarious. Hope you enjoy your weekend! thanks for sharing, just added it to me TBR!